LUFCTALK • View topic - Toilet paper! ‍Strange, but I've ALWAYS done left pic, almost a bad luck superstition for me to do it as the right hand pic ... but according to the US inventor in the 19thC it is indeed 'correct' the LH one ... what do other posters 'do'??! Whichever way its facing when I take it out of the cupboard. johnh wrote: Whichever way its facing when I take it out of the cupboard. I couldn't care less and to suggest there's a right or wrong way is ridiculous .. The left hand-picture presents the paper to you, the right-hand picture forces you to look for it. Apparently. "The pic on the left is correct, anyone doing it the other way needs to take a long hard look at what their life has become. They've actually done studies on this before and found that people with lower incomes (or education, can't quite remember) do it like the right hand one. I can only assume this is because these people are indeed - as I hope everyone here will agree - stupid and don't understand that their way is quite clearly wrong. LH method you can quite clearly see where the tear lines are, you know how many sheets you'll be getting and your paper is less likely to brush up against a gross bathroom wall. If you do the RH way I have zero respect for you as a human being and frankly think you should put yourself down the toilet along with your poorly ripped, quantity-of-sheets-unknown, germ-infested toilet paper." 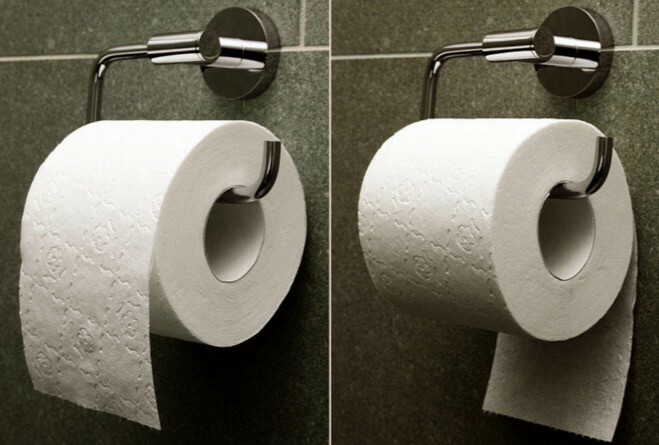 Blimey, you can tell it’s the international break when we are discussing toilet paper. Funnily enough i always take it off the holder and at home i sit on top of the holder much to the annoyance of my partner. We used to nick toilet rolls from wherever we could back in the day & lob them from The Gelderd onto the pitch. Happy days, when did lobbing toilet rolls stop ? Mr Russell wrote: Funnily enough i always take it off the holder and at home i sit on top of the holder much to the annoyance of my partner. Surely it's better to sit on the toilet?